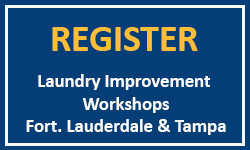 Eastern Funding continues with its free Laundry Improvement Workshops in some of the largest laundry markets across the country. Building on the successful start to the series earlier this year, the next events are scheduled for January 29, 2019 in Tampa and January 31, 2019 in Fort Lauderdale. All laundry owners are invited to attend.